When it comes to heart health, a lot of what we hear about focuses on cholesterol and how that can affect your health. What often gets forgotten, however, is high triglycerides. There is plenty of evidence to show that high triglycerides levels (hypertriglyceridemia) can be a significantly bad thing for your heart’s health. In this article, we will take a look at what exactly are high triglycerides levels, which foods to add to your high triglycerides diet, which foods to avoid, and even a high triglycerides diet plan to start you on your way to better heart health. 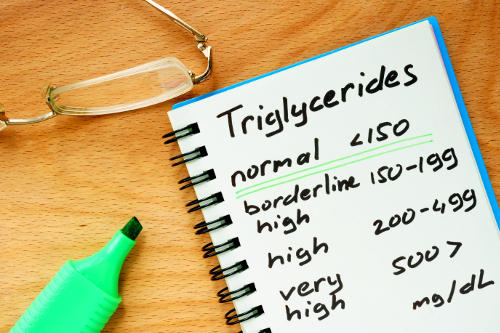 Think of this as a beginners guide to everything about high triglycerides. Triglycerides are a type of fat. They are found within your blood stream, and the body burns them as a source of energy. High triglycerides, however, can be a possible symptom that you are running the risk of heart disease, as well as metabolic syndrome (which is the combination of high blood sugar, high blood pressure, too much fat around the waist, low HDL cholesterol, and high triglycerides). It’s due to this that some researchers think that knowing your triglycerides level is just as important as knowing what your cholesterol level is. Ideally, you want your triglycerides levels under 150 milligrams per deciliter (mg/dL). 150 mg/dL is around the borderline level, and anything above 200 mg/dL is considered as high. Essentially, the higher your triglycerides level is, the more they can build up and do damage to your arteries, and eventually your heart. Now, there are several ways to lower the triglycerides level. The first thing is to adopt a diet and a set of guidelines that can not only help bring your high triglycerides level back to a normal level, but will also have good tasting food. Before you begin a hypertriglyceridemia diet, you should be aware of what you’re actually trying to do with that diet. The following are some guidelines to keep in mind for the diet, that will help make your shopping and meal prep easier to follow and understand. Part of the goal of any diet for hypertriglyceridemia is to lose weight. Losing weight will not only help lower your triglycerides level, but it will be healthier for your heart as well. Overall, these diets are designed to limit your sugar intake. From juices and soda to fruit and even some flavored waters, sugars can easily become triglycerides when digested, so you’re going to want to limit them. Healthy or unsaturated fats are in. In fact, they may help fill you up a little more, and keep you away from carbs that would turn into triglycerides. Starchy foods like rice, potatoes, pasta, and bread should also be limited due to what happens to starch in the digestive process. When broken down by the body, starches can become triglycerides, especially if they are eaten in large amounts. Meals that are low in fat and high in protein are encouraged, as they can provide energy and do not create much in the way of triglycerides. While not food-related, diet alone can only do so much. Adding exercise to the plan will help you lose weight, while the body uses triglycerides to build muscle. Alcohol promotes the creation of triglycerides. It’s best to avoid it as much as possible, if not completely eliminate it. Now that we’ve gone over the basics, let’s take a look at the specific foods you should be avoiding so you can lower your triglycerides level. Since we’ve gone over the hypertriglyceridemia guidelines for your diet, it’s now time to expand into what specific foods you should try to avoid to lower the triglycerides level in your body. First, there are a few general food groups you should avoid. While it’s healthy eating to avoid saturated fats in general, in the case of this diet, it’s a must. Saturated fats produce triglycerides. Foods filled with sugar can help create triglycerides. Avoid sugary drinks, candy, and even natural sugar-filled foods like honey and fruits. As we mentioned previously, starches tend to metabolize into sugars, which can turn into triglycerides. With those in mind, there are also some specific foods and food types that should be avoided. While many might assume that natural honey and real maple syrup wouldn’t be bad for you due to their sugars being natural, they can still raise your triglyceride levels. Refrain from eating pastries, cakes, and cookies. These foods tend to be filled with sugar and saturated fats like butter, both of which can create triglycerides. Meats that are high in fat like red meat, bacon, sausage, and processed meats will raise the triglycerides level, as well as bad cholesterol. Butter and margarine are a filled with saturated fats and trans fats, which mean that they can help create triglycerides. We know, it really sounds like we’re taking the fun out of eating, but don’t worry. There are tons of good foods that are still on the eat list. While there are a number of foods that you should avoid when trying to lower your triglycerides level, there are also several foods that can help you in your quest for lower triglycerides. Olive oil has some non-saturated fats, and is a pretty solid choice for helping lower high triglycerides levels. The nice thing about olive oil is that it can be used as a butter substitute in many recipes. Spinach is high in fiber, low in calories, and all around good for you—especially when it comes to triglycerides. It has a good amount of alpha-lipoic acid, which can help reduce high triglycerides levels by a possible 60%. Many fruits are not great for lowering triglycerides levels due to their sugar levels. However, grapes contain resveratrol, an antioxidant that can help curb hunger, especially green grapes. High in fiber and low in triglycerides, beans can also help you feel fuller, which helps with weight loss. Please note, this doesn’t include baked beans that are packed with maple syrup. Now that we have the foods that you should avoid and the foods that can help, we can move on to tips for your high triglycerides meal plan. We’ve taken a look at the foods you can eat, as well as the foods to avoid while trying to lower high triglycerides levels. There are a couple of key points to this diet to remember. Water helps to flush out your system of excess minerals, and has no fats or calories. Remember, changing your diet will definitely help you lose weight and lower triglycerides, but if you exercise, it will help things move along at a better pace. Besides, exercise is good for you. Vegetables are great for this diet as they don’t often contain sugars or starches. Green vegetables, in particular, can help make you feel fuller and keep your food cravings down. If you keep these in mind along with the other food tips presented, you can be well on your way to lowering your triglycerides level. High Triglycerides Levels Can Be Dealt With! High triglycerides levels can be an issue. It can lead to heart issues and metabolic syndrome. With all of those health issues, it may seem like such an uphill battle to fight, but take heart. With a good diet plan, monitoring what you eat, and regular exercise, high triglycerides levels can be dealt with. Iliades, C., “Diet Tips to Reduce High Triglycerides,” Everyday Health, April 6, 2011; http://www.everydayhealth.com/heart-health/diet-tips-to-reduce-high-triglycerides.aspx. “What Foods Do You Avoid If You Have High Triglycerides?,” SF Gate, http://healthyeating.sfgate.com/foods-avoid-high-triglycerides-8144.html. “Foods to Avoid If You Have High Triglycerides,” WebMD, http://www.webmd.com/cholesterol-management/ss/slideshow-triglyceride-foods-to-avoid. “High Triglycerides: What to Eat, What Not to Eat,” TGs Formula, http://www.tgsformula.com/triglycerides_lowering_diet.html. “Triglyceride-Reduction Grocery List,” Dr. Oz, http://www.doctoroz.com/slideshow/triglyceride-reduction-grocery-list?gallery=true. “High Triglycerides – Topic Overview,” WebMD, http://www.webmd.com/cholesterol-management/tc/high-triglycerides-overview.